Last week, I finally got my chance to see Sharknado. Case in point: One of the major early features of the movie is the fact that "a hurricane is striking California for the first time." If this movie coincided with reality, this would actually be more or less true, as storms of that caliber formed in this part of the Pacific move West, away from the Southern California shore. There really haven't been tropical cyclones hitting that particular part of the US, because wind and the motion of the Earth and the cold California waters all say "no." But don't worry, weather sticklers; the hurricane is only present for about 1/8 of the shots, anyway. In the rest, it's a either a mildly cloudy day, or if the sky isn't in the show, downright clear and sunny (you can tell by the golden light and the strong shadows). where I got this screenshot. by giant sharks. Because, that's why. Of course there was quite a bit of gratuitous shark. After all, it's Sharknado. There are sharks found only in warm Atlantic waters storming the Pacific coast from the West and mixing freely with sharks found elsewhere. The sharks only eat humans, target humans, and go after humans, in a complete and utter reversal of actual shark taste and biology (very few species will eat people; we taste bad. Most will let go after a single bit.) And then there's the rather obvious flip-of-the-bird to every kind of physics and biology, such as when a 10-foot shark repeatedly swims out from behind a 3-foot-wide door, like a psycho in a horror film with access to a dimensional portal. This was all before the sharks became airborne. And I haven't even mentioned the ridiculously inconsistent water levels yet... Like the house that floods from the inside until it collapses and sends water streaming down the hill, or the giant hammerhead sharks swimming around in about 18 inches of water. 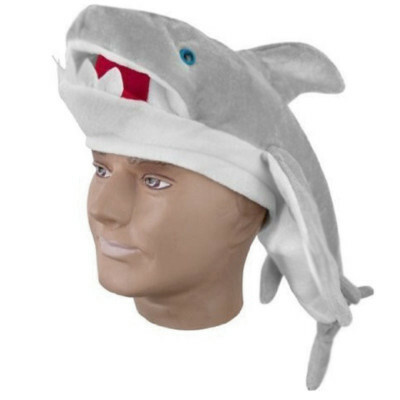 There was so much gratuitous shark, in fact, that at one point after the sharks started flying, someone began throwing a shark hat into the air, and it took me a moment before realizing the hat wasn't part of the show. In fact, it wasn't until the shark was thrown a second time that I was sure. This despite an obvious "something in front of the screen" shadow. 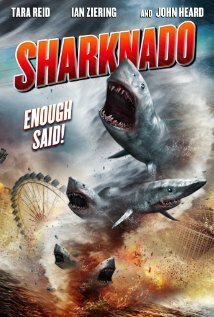 On the whole, I'd say this is pretty much exactly what it set out to be: a horrible, terrible, spectacularly funny fail of a disaster movie. From shallow romances that don't even follow their own logic (Wait, are you the father's girlfriend, or the son's? ), to chainsaws and sharks that swallow people whole, to random rappelling-down-to-save-the-obligatory-children-who-mysteriously-disappear-to-safety-afterwards, to sharks who do everything from breathe air, fly, and climb ropes, it's a movie 100% made for heckling. The poster was right. Sharknado, enough said.